Please consider that learning to row requires a time commitment for lessons and additional time on the water from you. Also consider that our volunteer instructors are giving you their time as they share their knowledge with you. 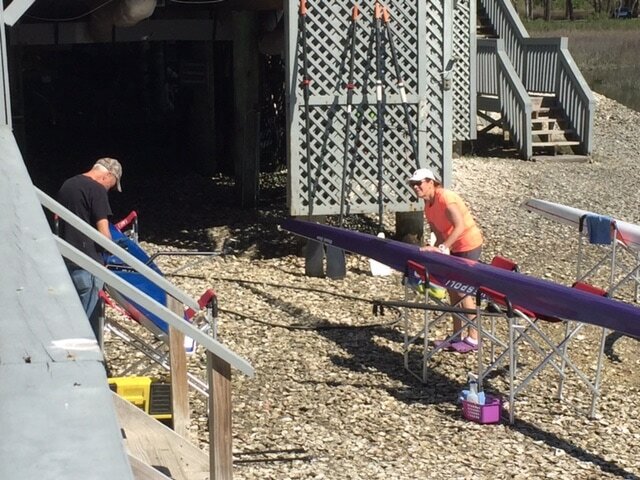 The rowing basics can be learned fairly quickly, and many people can “solo” after 2-3 lessons. After you become a member, you should plan on rowing weekly to maintain and improve your new skill. While rowing is a sport that most people can do, and is a fun, full-body workout, as with any fitness activity, it is the participant’s responsibility to be in good health before beginning. If in doubt, please check with your physician. For your enjoyment and safety, you must also meet our minimum physical requirements for members. These include being able to swim, lift and carry the boat to/from the boathouse with another member, get in/out of the boat at the dock, not exceeding the weight capacity of the boat, and being able to turn your neck from side to side while rowing.